This iExpression can be used to simulate the output of a computer terminal. The text is faded it character by character and scrolls such that only a given number of lines is visible. 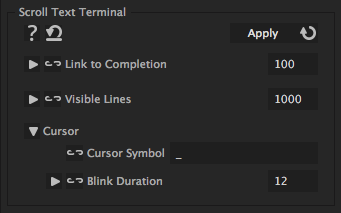 Also, a (optional) blinking cursor symbol is attached. How far the text is already scrolled (0 to 100%). Link it to a slider to keyframe it. How many lines of text are visible simultaneously. The caret symbol that is blinking at the end of the text. Empty for no caret. controls, how fast the cursor is blinking. 12 means it stays 12 frames visible and then 12 frames invisible.